If there’s one healthy and nutritious food that most people love, it’s the avocado. Avocados are commonly used as go-to ingredients for smoothies, wraps, salads and most especially guacamole dips.This favorite fruit (yes, the avocado is technically a fruit and not a vegetable) provides heart-healthy mono- and polyunsaturated fats and it contains quite a bit of potassium and dietary fiber as well. Whether you’re slicing, dicing, or mashing them up, here’s everything you need to know about avocados, including how to pick a ripe one. Reducing fat intake is not enough to reduce heart disease. It is also important to replace saturated fats with unsaturated ones which can be found in avocados. Packed with healthy monounsaturated fats, avocados will help boost that good cholesterol and lower the bad cholesterol. Over 75 percent of the fat in avocados is unsaturated fat. 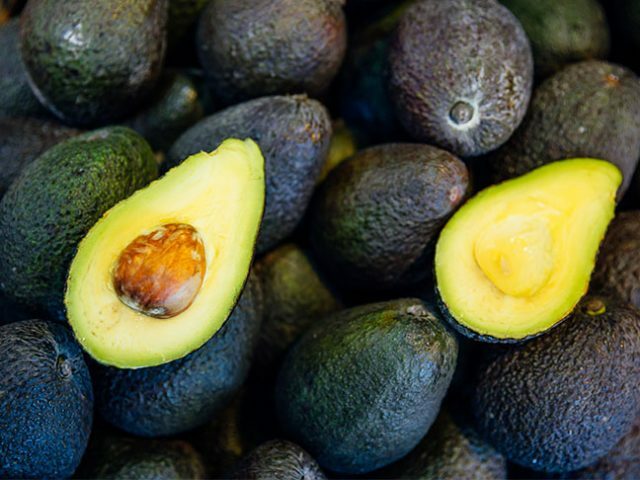 Avocados are a good source of dietary fiber, which helps reduce the risk of heart disease, type 2 diabetes, and obesity, according to the California Avocados website. Dietary fiber is known to create a feeling of satisfaction, which can prevent overeating. Fiber also contributes to weight loss by helping with gut bacteria. For every 100 g of avocado, you get about 7 g of fiber. In one avocado, there are 10 grams of fiber, which is more than the content of most slices of whole grain bread. Your body needs calcium to build, repair and maintain your bones and teeth. A diet lacking adequate calcium may increase your likelihood of osteoporosis and other health issues. A 1-cup serving of cubed fresh avocado contains 18 milligrams of calcium, reports the U.S. Department of Agriculture. In addition to calcium, Vitamin k is essential to good bone health. Half of an avocado provides approximately 25 percent of the daily recommended intake of vitamin K.
While bananas are the most popular source of potassium, avocados have double the amount of potassium than bananas do. The California Dairy Council notes that potassium is a main health component of the fruit — a nutrient that helps promote healthy heart contraction and reduces high blood pressure. If you eat a whole avocado, you’d get 20% of your daily potassium needs at once. Look for avocados that are just slightly soft to the touch, but avoid any that have cracks or sunken, discolored areas. Need a ripe avocado in a hurry? To speed up the avocado ripening process, place your unripe avocados in a brown paper bag with an apple or banana. The plant hormone ethylene, which occurs naturally in fruits like apples and bananas, triggers the ripening process. Gently squeeze the avocado – if you are able to lightly indent it with your fingertips, then it is probably ripe. Rubbing the exposed avocado with lemon juice or another acid will delay the browning process. So will keeping the pit in contact with the avocado at all times. You can keep a ripe avocado in the refrigerator for about a week. You should wash avocados thoroughly before slicing into them; this helps prevent any germs that may be on the skin from getting on the fruit inside.